Home Tags Posts tagged with "spanish parliament"
Riot police have ringed the Spanish parliament in Madrid as protesters gather for a march against austerity tagged “Occupy Congress”. Metal barriers have been placed around the building to block access from every possible direction, correspondents say. Indignants, as the protesters are known, say they are protesting at the “kidnapping” of democracy. Spain’s provinces have piled pressure on the government with a possible new bailout request and an early election. Andalucia is considering asking for a 4.9 billion euro ($6.3 billion) emergency credit line from the central government, a spokeswoman for the regional government confirmed for Reuters news agency. Three other regions – Catalonia, Valencia and Murcia – have already said they will seek emergency funds. There is real concern in Europe that Spain may need an international bailout going beyond the 100 billion euros ($125 billion) pledged by eurozone finance ministers in June to rescue its banks. 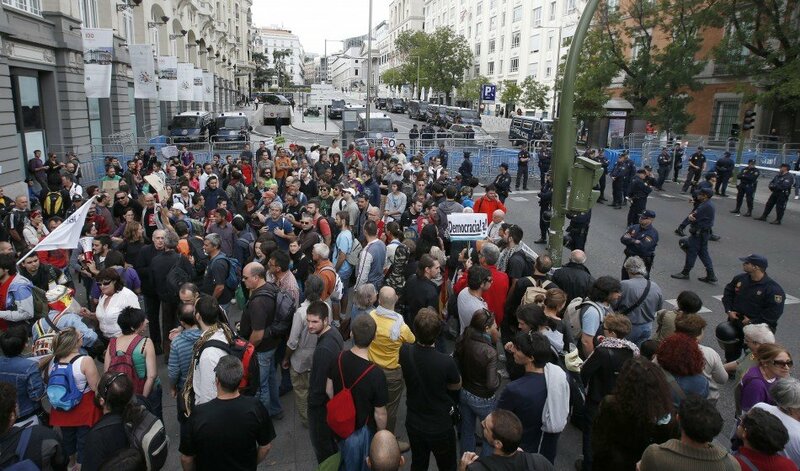 Thousands of people have gathered in central Madrid for the march to parliament, due to begin at 17:30. Buses were reportedly laid on to ferry demonstrators into the capital from the provinces. Another demonstrator, Montse Puigdavall, said: “I’m here because of the situation we are living in now, because of all the social cuts and rights that we have lost, that took a lot of hard work to achieve. Under Spanish law, people who lead demonstrations outside parliament that disrupt its business while it is in session may be jailed for up to one year, AFP notes. Clashes have broken out at previous rallies and marches against the cuts and at least 1,300 police are said to be on duty at the Congress building. The Spanish government is having to borrow heavily to cope with the effects of a property values collapse, a recession and the worst unemployment rate in the eurozone. His government insists the 100 billion-euro pledge does not constitute an international financial rescue. If Mariano Rajoy does request a bailout, it may not happen before late October because of a regional election in his home province, Galicia. Catalonia’s election decision comes days after Mariano Rajoy rejected a request from the wealthy but indebted region to run its own fiscal affairs. “It is time to take the risk,” Artur Mas told the regional parliament.